Welcome to the Maurice River! Historically the Maurice River has an extensive maritime history centering around oystering and other fisheries. This rich cultural background is a primary reason for the inclusion of the river system in the Wild and Scenic program. Together with the area's unparalleled natural resources, including numerous threatened and endangered plant, animal, and bird species, it makes the watershed a unique place to visit. Citizens United to Protect the Maurice River and its Tributaries - History, information, and action items about the Maurice River's grassroots conservation organization. Natural Lands Trust - Land protection efforts include a 1,000-acre Mauricetown Preserve and the Peek Preserve near Millville. The Nature Conservancy - TNC protects lands along the Maurice River and the Delaware Bay, and maintains its Delaware Bayshores Office at the Eldora Preserve near Delmont. New Jersey Pinelands Commission - Information about the Pinelands Protection Area. Pinelands Preservation Alliance - The Pinelands' non-profit watchdog organization. New Jersey Audubon - Birding and birding workshops in NJ. Haskin Shellfish Research Lab - The Rutgers oyster research site in Cumberland County. Discover Delaware Bay - The Bayshore Center at Bivalve, home of the oyster schooner the AJ Meerwald. 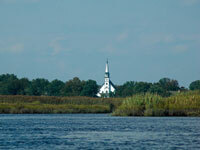 Cumberland County Birding - Prime birdwatching sites in the county. ALL ARTWORK AND PHOTOGRAPHS ON THIS PAGE ARE COPYRIGHTED BY LESLIE M. FICCAGLIA. THE USE OF ANY SUCH IMAGE WITHOUT PRIOR WRITTEN PERMISSION FROM THE ARTIST IS PROHIBITED.